"Over the years I perfected my corridor skills. I think I ran down corridors better than any other Doctor." In 1963, the BBC began airing Doctor Who, a quirky little sci-fi show about a rather strange and crotchety man (known only as 'The Doctor') who, along with two mysterious female companions, was able to travel through time in a strange machine, the TARDIS, that, on the outside, appeared to be a police telephone booth right out of the heart of London. Though the show started out with the Doctor visiting past Earth times as a form of semi-educational television, eventually things got more interesting and even moved into outer space. Almost immediately, the show was a tremendous success with British viewers, thanks largely to the appearance of one of the programs most memorable villains, the Daleks. Unbeknownst to its creators, the show would go on to last for 30 amazing years, spanning 7 actors in the role of The Doctor and linking generations of sci-fi fans. While many dismiss the show for its relatively low budget and darkly humorous nature (some people like their sci-fi more serious), it remains one of the most amazingly entertaining and finely-crafted shows ever made, latching onto that powerful storytelling ability British television seems to embrace. 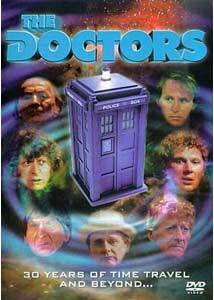 This documentary, The Doctors, is a rather brave attempt to look at this 30 year event in a one-hour program featuring many of the actors, writers, and producers who worked on the series. While the filmmakers seem to have been granted some rather impressive interviews to make this film, they also use some interesting, and most likely very rare, behind-the-scenes footage of Doctor Who episodes being filmed. Despite some quality issues (discussed later), The Doctors is actually an extremely entertaining work for any fan of the show and tells the story of how each actor came and went. While great compression is often required here, there is still an air of respect and equal coverage to each of the seven actors who were part of this television phenomena (eight if you count Paul McGann's appearance in the failed British/American crossover pilot The Enemy Within for Fox TV). As one might expect, the focus here is on the actual Doctors themselves, not really the villains or individual storylines; it's all about the actors and their personalities. While not all the actors participate in this documentary (some are, of course, deceased), contributions come from the late Jon Pertwee, Peter Davidson, Colin Baker, and Sylvester McCoy, who all played the third, fifth, sixth, and seventh Doctors, respectively. The interviews provide a very interesting and personal insight into the Doctor Who experience, especially the discussions with Colin Baker, who is probably the most overlooked of the Doctors. As Baker was playing the Doctor during a time when the show was under constant threat of cancellation and starting to waver in popularity, his second-season-only role was sparse and under-appreciated. Conversations with producer John Nathan-Turner also reveal that behind-the-scenes was a great deal of regret over the direction the show sometimes took, as well as relief when it eventually came to an end, being cancelled in 1989. You can still sense that tangible sadness in the air about the series' cancellation, especially when we see Sylvester McCoy, the last actor to play the character, so thoroughly likable and filled with the charisma required for the role. While not perfect and certainly not a forensic examination of the Doctor Whophenomenon, The Doctors does offer an interesting, personal look at the actors behind the cult fandom. Their words, uninterrupted by overdone, journalistic narration or fancy editing, offer a very different look at this TV show so many have loved for so long. While all of them enjoyed working on it, we hear realistic attitudes towards the problems making it, and even the honest opinions of Peter Davidson, who felt his seasons and those following were mediocre. I don't agree, personally, but that's not really the point. The filmmakers take a smart, hands-off approach and rather than injecting their own commentary or opinions, let the people behind the Doctors speak for themselves. Image Transfer Review: While I'm not sure what went wrong on this disc, the image transfer is quite horrible. To put it literally, the film looks like it was made in very basic, home video format, then somewhere in the process of being put on DVD, was enlarged and zoomed-in a bit. The result is a horrible pixelated image that looks very much like typical, streamed-over-the-internet video. This strange enlargement (or lack of proper aspect ratio) also, unfortunately, moves the text off the bottom of the screen, which is often used to tell you who is being interviewed and what their function or role was in the Doctor Who series. This is mostly unreadable. There are no good sides here; the entire disc is simply atrocious. It doesn't completely kill the content, especially for the fan, but whatever happened to make this supposed BBC documentary look like this is inexcusable to have been released publicly for money. Newer, more advanced DVD players with a zoom-out feature might be able to windowbox the film and make it look more suitable. Audio Transfer Review: The mono audio is quite murky and muffled, and often very hard to understand. To fully enjoy the documentary, one will have to be extremely quiet and crank the volume up a bit. There is also noticeable analog hiss and hum through most of the scenes. Rare home movie footage reel. Extras Review: There are no real supplements to the disc, but some of the home movie footage (seen briefly in the documentary) is put on a separate reel. Unfortunately, it is not much better quality than the documentary. The footage is mainly behind-the-scenes work on The Abomnable Snowmen (from the Patrick Troughton days) and Shada, the "lost" Tom Baker episode only recently released in partially completed form. There is no chapter menu, which makes seeking annoying, but the film does have chapter stops. While the discs' cover is designed well, a little more in the way of presentation would have been a bit better. Interestingly, the main menu features pictures of all the Doctors, including Paul McGann, despite the fact McGann and his television movie aren't mentioned at all. While the technical aspects of this disc are disappointing, Doctor Who fans really need to see this surprising little film in which the Doctors themselves do all the talking. Now that the series is slowly working its way onto DVD (which will take years and years to complete), the awareness of this grand sci-fi experience might grow even larger and, most likely, a new generation of fans will be born. Although The Doctors feels a little amateur, it obviously has the passion of the fans as its motivation.